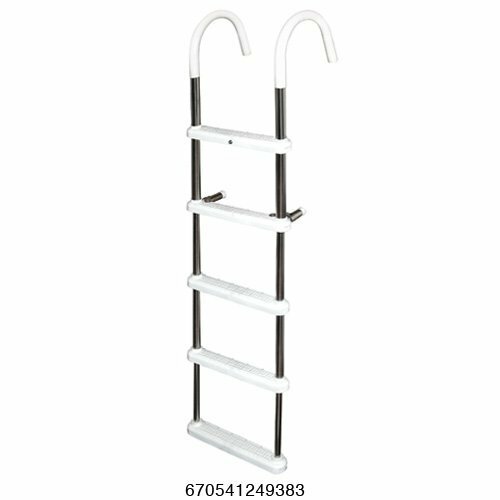 JIF Gunwale Ladder Hook Ladder - 7" HookAvailable in 3, 4 & 5 StepFeatures: Stainless steel 316 tubing Folding vinyl covered hooks for flat storage 400 lb. capacityDimensions:DMT3-7 3-STEP GUNWALE HOOK LADDER Overall Height: 40" Width: 15" Hook Depth: 7" Weight: 8 lbs.DMT4-7 4-STEP GUNWALE HOOK LADDER Overall Height: 48" Width: 15" Hook Depth: 7" Weight: 9 lbs.DMT5-7 5-STEP GUNWALE HOOK LADDER Overall Height: 60" Width: 15" Hook Depth: 7" Weight: 10 lbs. If you have any questions about this product by JIF Marine, LLC, contact us by completing and submitting the form below. If you are looking for a specif part number, please include it with your message.